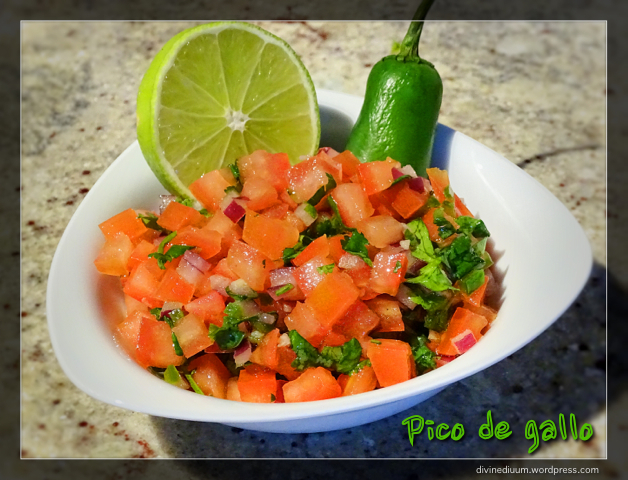 Fresh pico de gallo is a wonderful and healthy snack that can be eaten alone or served as a sauce with other dishes. 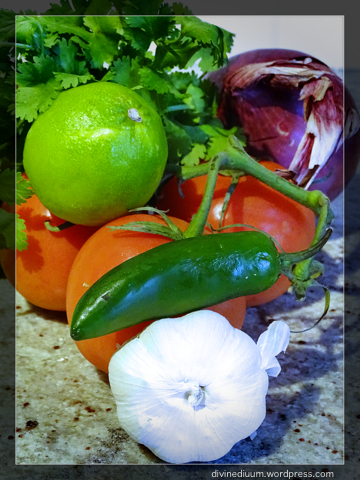 Salsa in Spanish means sauce and pico de gallo is a type of sauce. However, the name really has nothing to do with what the food is as its direct translations means the “beak of the rooster”. Nonetheless, this chunky-style salsa has become a popular condiment. 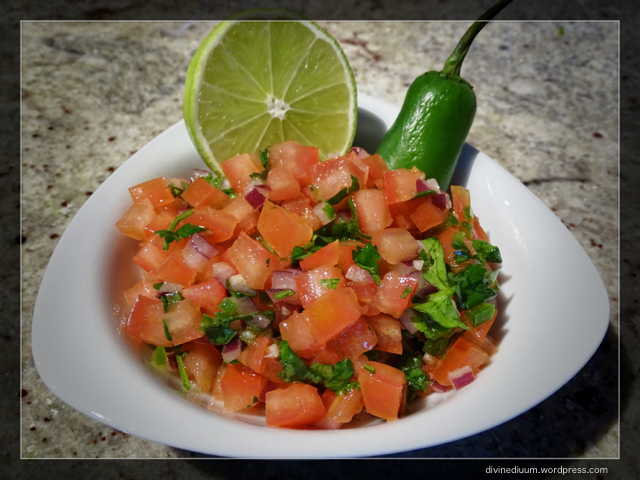 The ingredients are simple: fresh tomatoes, red onion, jalapeño pepper, garlic, and cilantro. Each ingredient should be cut up in little pieces. Use the tomatoes as a gage. From that, cut the onions to about 1/2 the size of the tomatoes. Unless you really like biting down on a large piece of onion, keep the pieces small for flavour. The jalapeño should be even smaller than the onion for the same reason. 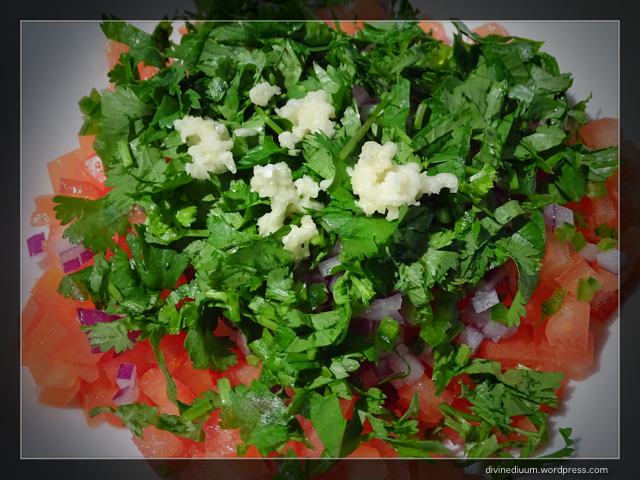 You can then add a clove of minced garlic and fresh cilantro before tossing the ingredients in the dressing. 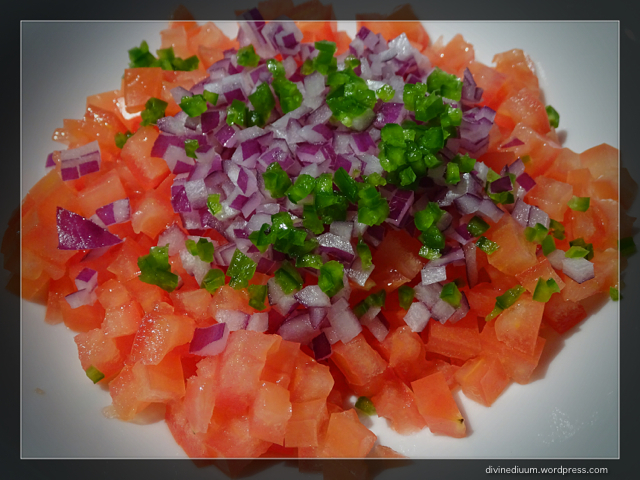 For the dressing, mix in 1/4 tsp of salt, a pinch of pepper, 1 Tbsp of olive oil and the juice of 1/2 a lime. 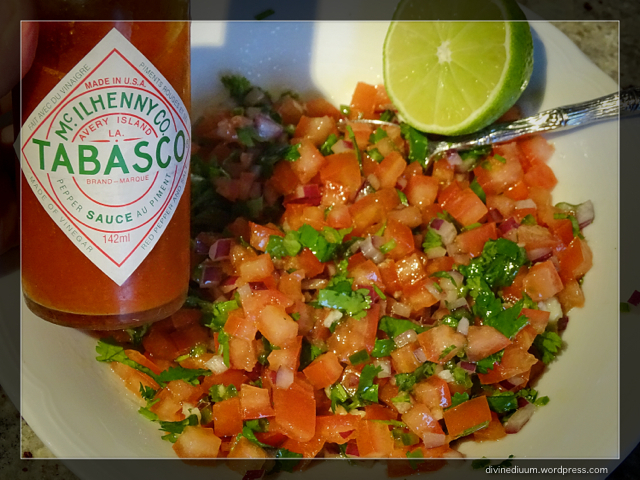 I prefer a bit more kick to my pico de gallo so I add a tsp of tabasco sauce. Another option if you like spice is to finely chop the whole jalapeño rather than using only 1/2. Serve with chips or on chicken or try out my version of a taco salad. 1. Dice tomatoes into small pieces. 2. Dice red onion to 1/2 the size of tomatoes. 4. Combine tomatoes, onion, jalapeño, cilantro and garlic. 5. Mix in salt and pepper. 6. Stir in olive oil, lime juice and tabasco.